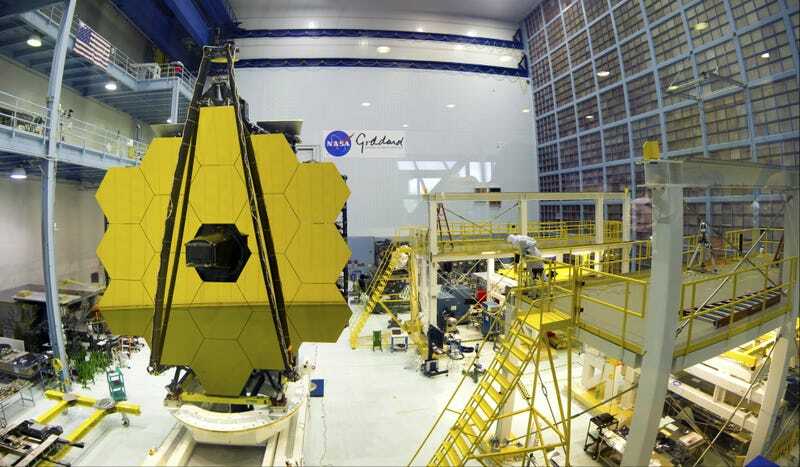 The James Webb Telescope, pictured here, has been plagued by delays, technical hurdles, and shoddy workmanship. The US Government Accountability Office released a scathing report in May claiming that NASA’s most expensive projects have “deteriorated” significantly in the past year both in terms of added costs and scheduling delays. Earlier today, NASA had to explain itself in front of a Congressional subcommittee, where it admitted that advanced space technologies don’t come easy—especially when Congress gets in the way. The purpose of today’s hearing, organized by the Committee on Science, Space, and Technology, was to figure out where NASA is lacking in its ability to plan and execute major projects, and to find ways of preventing dramatic increases in cost and scheduling. Indeed, as the May 1, 2018 Government Accountability Office (GAO) report showed, things have gotten a bit out of control. The average delay for NASA’s biggest projects is now at 12 months, which is the highest delay the GAO has seen in the 10 years it’s been producing these reports on NASA. Costs overruns increased to 18.8 percent, up from 15.6 percent in 2017. But the GAO couldn’t provide an accurate assessment of these cost growths because NASA hasn’t been able to provide a cost estimate for the Orion crew vehicle, a project that accounts for 22 percent of the overall agency budget, hence the ambiguous, hazy area for 2018 in the graph below. NASA’s budgetary overruns aren’t nearly as bad as they were from 2012 to 2014, as the graph shows, but the recent uptick has the government worried. The GAO report highlighted four specific projects as being the main culprits, namely the Space Launch System (SLS), Exploration Ground Systems, the Mars 2020 program, and Space Network Ground Segment Sustainment (SGSS), which have collectively experienced $638 million in cost growth and 59 months in aggregate schedule delays. These four projects “encountered technical issues that were compounded by risky program management decisions,” according to the report. Other projects, like the perpetually delayed James Webb Telescope project, have been marred by complex technical problems and poor workmanship (Northrop Grumman, we’re looking at you). The GAO identified nine out of 17 projects as having experienced “performance deteriorations,” both in regards to added costs and delays. The GAO is expecting big cost and schedule overruns in the future, as NASA is embarking on several new projects, and as other expensive projects are taking longer than expected to roll out. Today’s hearing, held at the Rayburn House Office Building in Washington, D.C., had an added sense of urgency given that NASA is planning to invest about $61 billion over the life cycle of its current 26 major projects, all of which have a life-cycle cost of over $250 million. “Performance has worsened after years of following a general positive trend,” testified Cristina T. Chaplain, the director of Contracting and National Security Acquisitions at GAO, at the hearing. The reasons, she said, had to do with “risky management decisions, unforeseen technical challenges—some avoidable and some not—and workmanship errors.” The technical hurdles currently being encountered with the James Webb Telescope, she said, should have been anticipated and budgeted for years ago. Chaplain also pointed the finger at Congress, saying “human spaceflight projects should not be running with low cost reserves.” She agreed that NASA is unique in that it’s constantly having to push space tech forward, but she said the space agency needs to take the proper steps to ensure cost overruns don’t overwhelm its entire portfolio of projects. Stephen Jurczyk, associate administrator of NASA, told the subcommittee members that the space agency works in an industry that involves considerable risk, saying NASA has to “identify these risk as soon as possible, and take actions promptly.” He said NASA has already adopted measures and protocols to ensure that budgets and timelines are kept, including JCL, or Joint Confidence Level, a system that helps to estimate costs in the face of extreme uncertainty. Jurczyk also talked about how NASA is open to independent reviews and audits, and how its “commitment to transparency and a willingness to identify risks” helps the organization make the required adjustments. Conceptual image of NASA’s Space Launch System. Echoing the opinions of his colleagues, Daniel Dumbacher, the executive director of the American Institute of Aeronautics and Astronautics, said NASA needs stable, consistent, and predictable funding from Congress, and that disruptions to budgets affect schedules and contracts, which in turn leads to additional costs. Budget uncertainty and threats of shutdowns, he said, forces project managers to develop backup plans (which requires time and money), while also contributing to confusion and miscommunication. Cristina T. Chaplain, the director of Contracting and National Security Acquisitions, at the today’s hearing. In terms of other solutions, the witnesses also proposed a “watch list,” where problematic contractors are flagged, and potentially excluded from future projects. When pressed to name some vendors that should be placed on this naughty list, Chaplain said it’s a difficult question to answer, as in some cases there’s shared responsibility. “It’s hard to parse out who’s responsible for a particular overrun,” she said, “even with workmanship issues.” That said, Chaplain named two companies she believes should be added to the watch list: General Dynamics, a prime contractor with the Space Network Ground Segment project, and the Harris Corporation, which was involved in the now-canceled Radiation Budget instrument project. Indeed, the issue with unreliable contractors was an ongoing theme throughout the duration of the hearing, with proposed solutions including fixed budgets, project incentives for hitting targets, and punitive measures in terms of lost profits. Many of these strategies are already in place, however, leading some subcommittee members to suggest a tightening of the screws. These solutions are all fine and well, and probably even necessary, but as both the witnesses and the subcommittee were inclined to admit, none of these measures should come at the expense of innovation and the drive to build cutting-edge space technologies. Some of NASA’s proposed future projects are just as bold, if not bolder, than the ones of the past. Looking ahead, the space agency wants to return to the Moon, launch a probe to Jupiter’s moon Europa, and send astronauts to Mars. Correction: A previous version of this post incorrectly named the project involving the Harris Corporation.